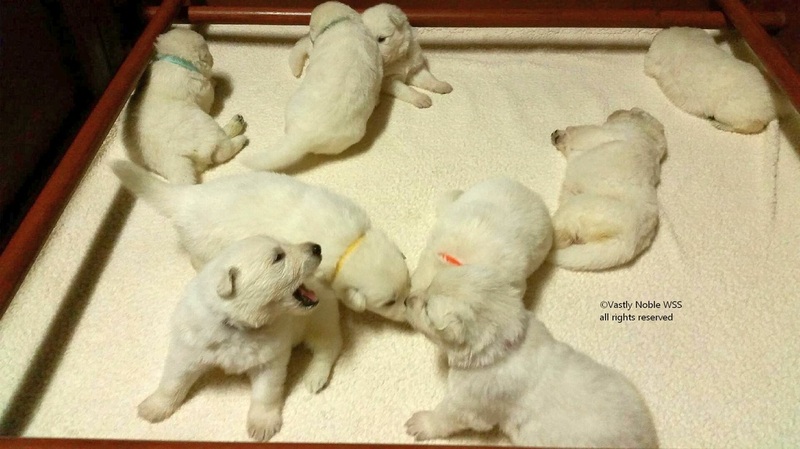 We are ecstatic at the arrival of 7 puppies on July 12. This is a repeat mating of Ch Konnie White Ancilias (imp SVK) to Iron Akbo-Parchovany (imp SVK). Here is a video of these gorgeous babies at 15 days old. 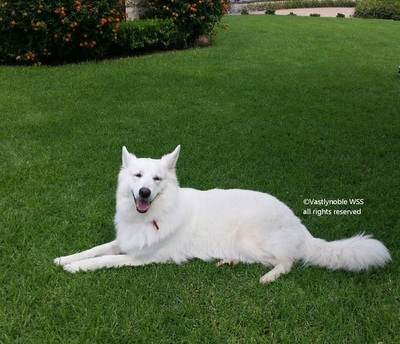 For any puppy please contact Vastlynoble WSS directly through ​http://www.vastlynoble.com/. 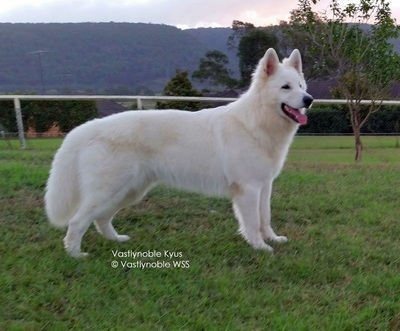 I am proud to announce a repeat mating of last year's successful litter between Iron Akbo-Parchovany (Imp SVK) to Aust Ch Konnie White Ancilias (Imp SVK) of Vastlynoble White Swiss Shepherds. Puppies are due early July. 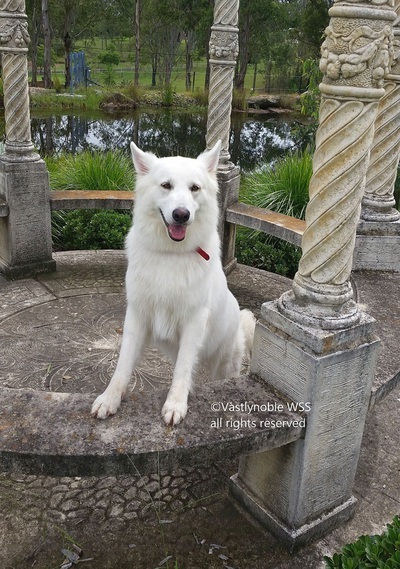 For more information contact Vastlynoble WSS directly through their website. 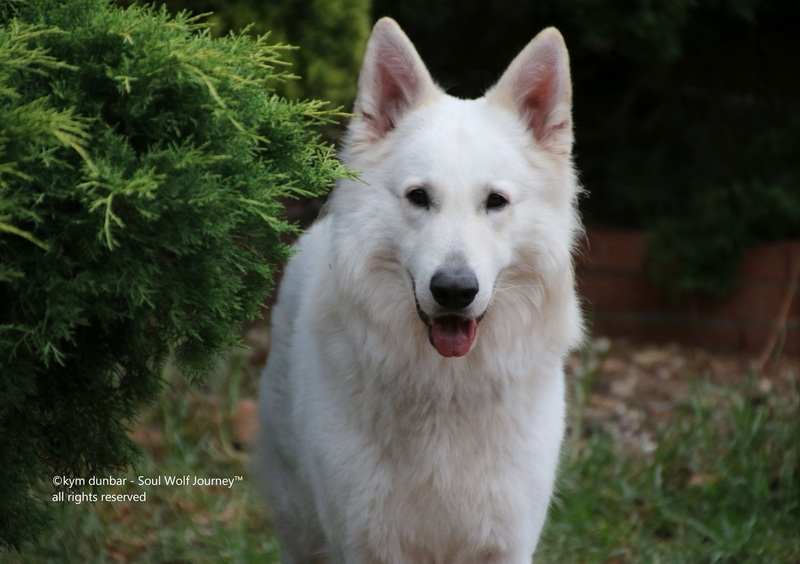 Here are photos of three puppies from the last litter, all at around 15 months old. All puppy owners are in love with their dogs, and all have outstanding temperaments. 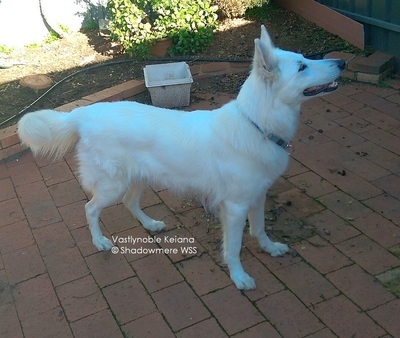 Vastlynoble Keiana (aka Ravyn) is my beautiful baby girl and we are so excited by her potential. 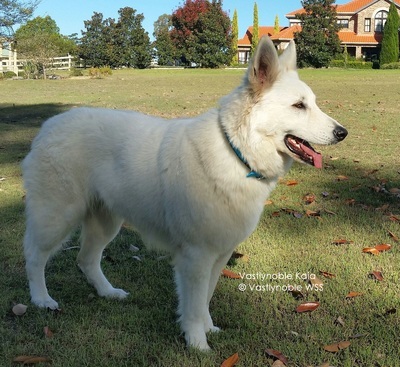 I am proud to announce the marriage of Iron Akbo-Parchovany (Imp SVK) to Aust Ch Konnie White Ancilias (Imp SVK) of Vastlynoble White Swiss Shepherds will result in the pitter patter of tiny paws late in the first week of March. To say I am over the moon is an understatement. This is the culmination of our dreams since these dogs came into our care, and of the breeders Eva and Marcel overseas who worked together to make this possible here in Australia. 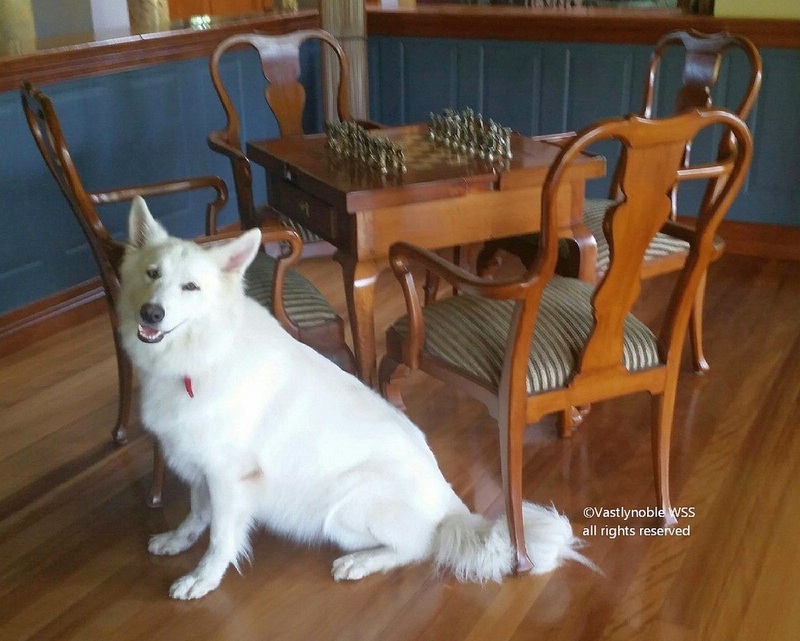 Both dogs are MDR1 clear, DM clear, have A/A hips and 0/0 elbows. 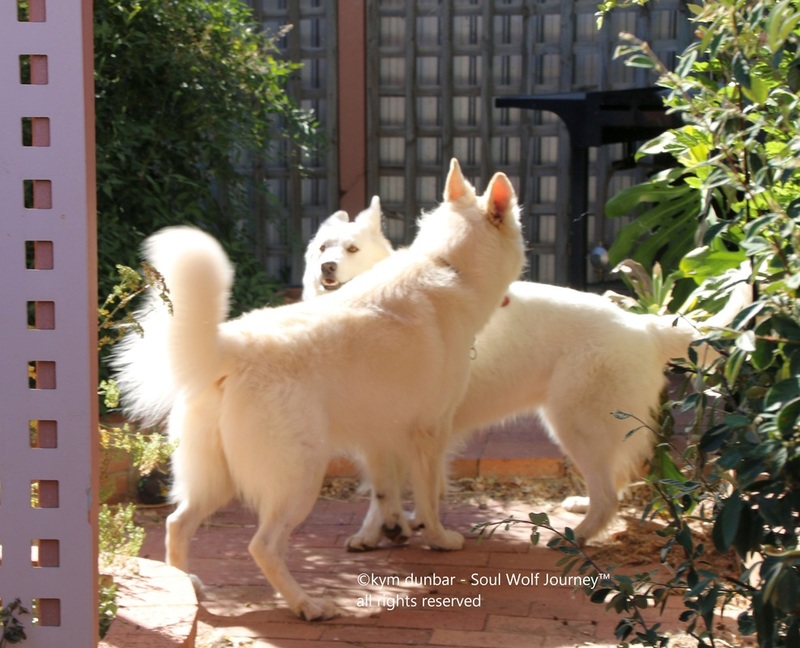 Konnie and Iron have similar temperaments, while stand offish when you first meet them they warm to you quickly if you earn their respect. Iron has a temperament I could only dream of but Konnie is so similar it is uncanny. 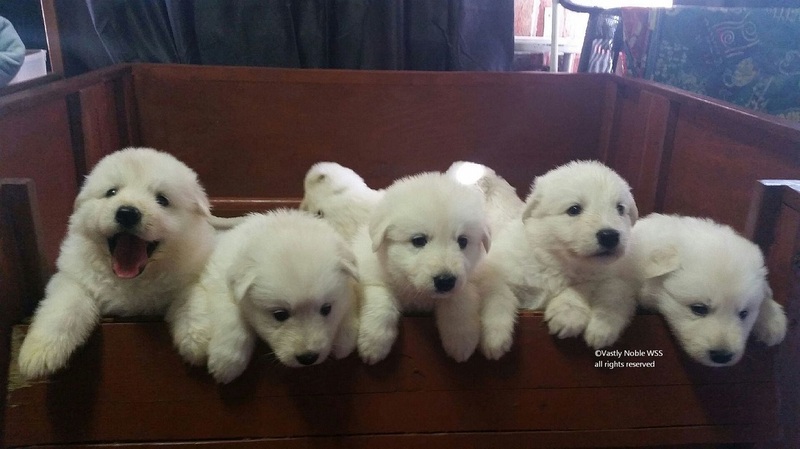 I am dancing on the ceiling with excitement at the possibilities of these puppies. This is an exciting litter for Shadowmere and Vastlynoble as this is the first planned litter for both of us with the dogs that stole our hearts. 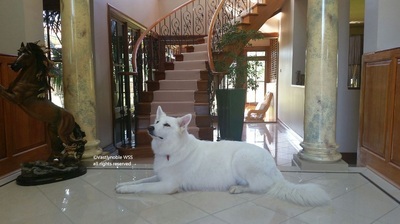 For more information feel free to email us through our contact page or Vastlynoble WSS directly through Dogzonline. 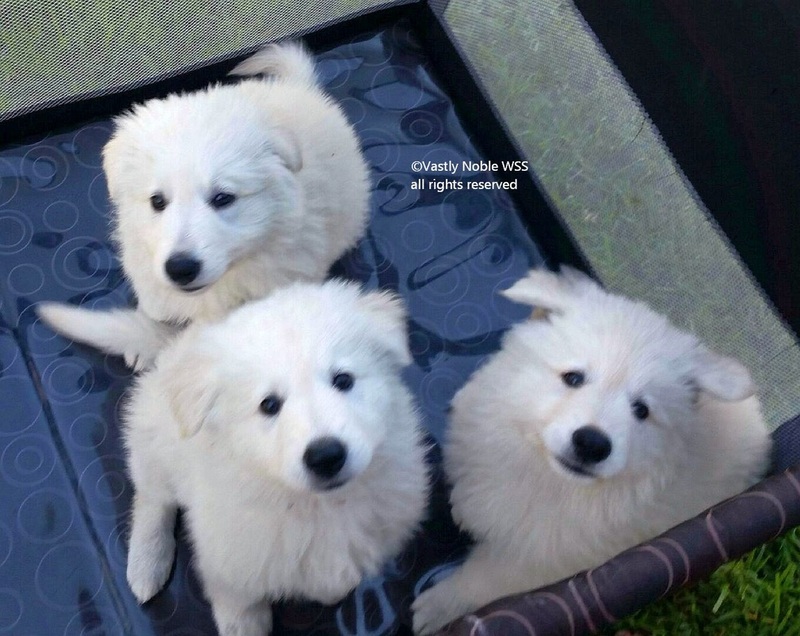 For regular puppy updates see our blog. 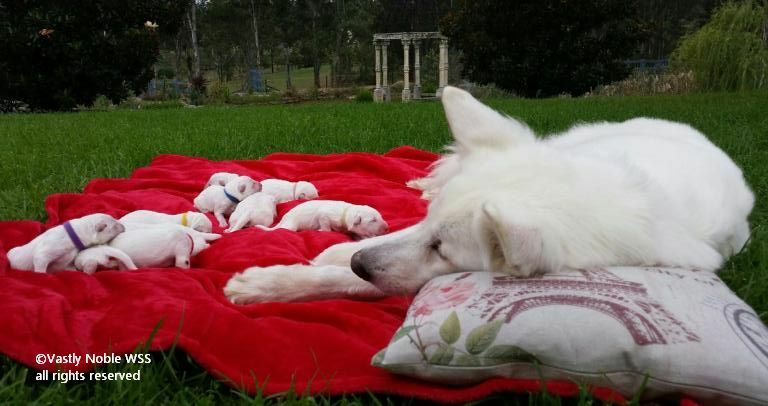 The pic is of Konnie with five of her babies ... how amazing does she look ... an absolute credit to Jane and Bill of Vastly Noble White Swiss Shepherds. Never have I been so excited. 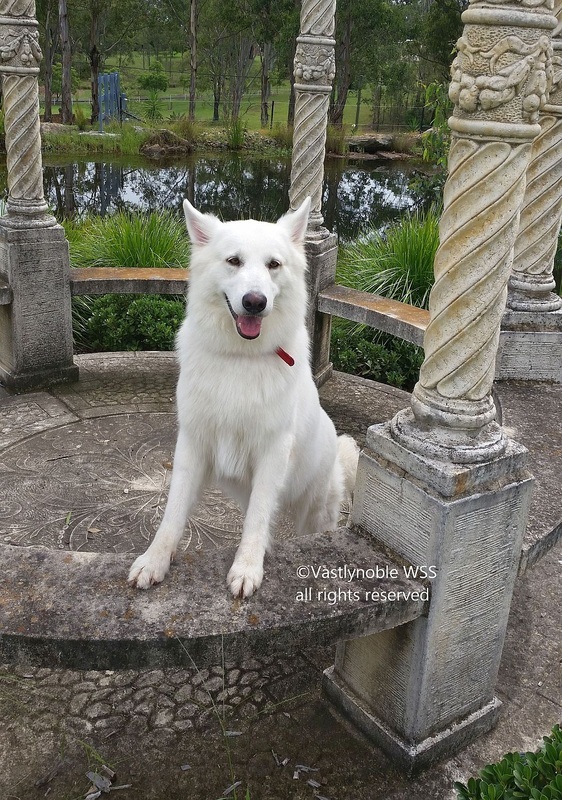 Jane from Vastlynoble White Swiss Shepherds has just sent through some updated images. 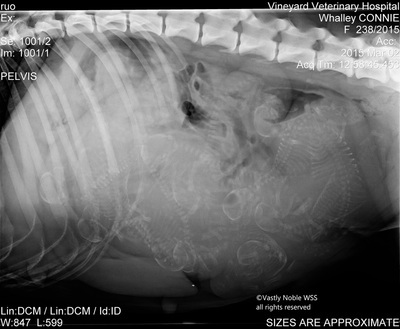 Puppies are due on March 8, 2015. Dr Zammit says Konnie has 10 babies waiting to hit the ground running. No guarantees of course. 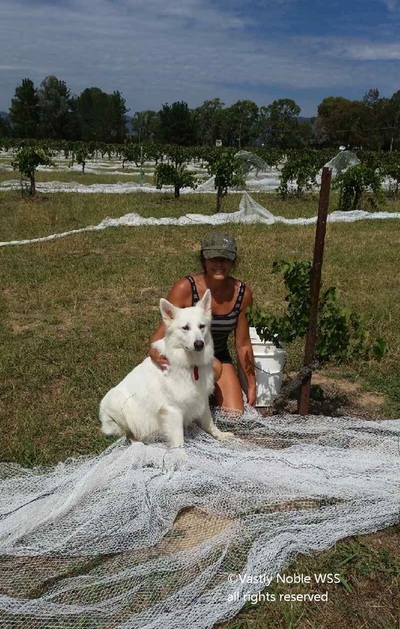 Princess Konnie helping Jane with the vintage Shiraz grapes on March 1, 2015. Thank you to Jane and Bill of Vastlynoble White Swiss Shepherds for sending these gorgeous photos of Konnie pregnant with Iron's puppies. This is so exciting. Princess Konnie is lady of the manor. Konnie chillaxing at home. 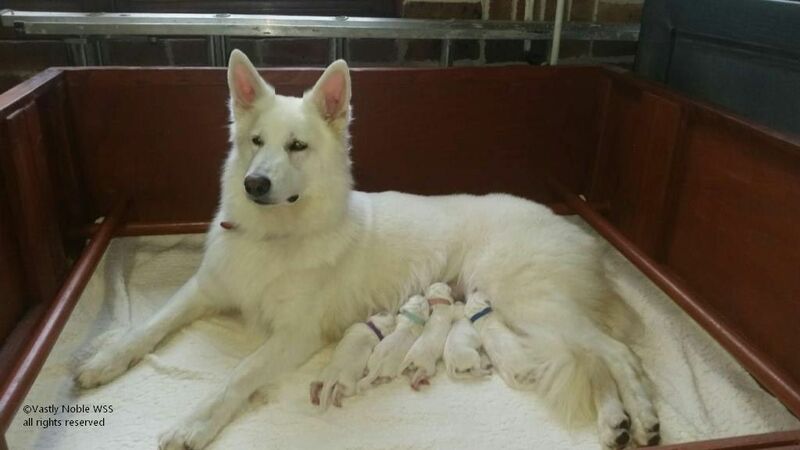 Only three weeks before the puppies are due. Iron romancing the gorgeous Konnie early January this year.